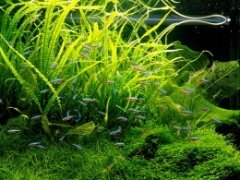 This video of some of the top tanks in the IAPLC 2009 just popped up on the forums lately, and although the quality isn't the best, it shows a glimpse at some gorgeous tanks. A word of caution about this video: the transitions are fast, violent, and frequently nauseating. Someone had a little too much fun with their video editing software. I'll be posting some full resolution pictures of the top tanks shortly. UPDATE: I've put together a slightly less harsh version, with ranks and in order. Watch it here. The transitions are fast, but the compilation its good. My tank appear. Slow gentle music, and a longer video, with very very smooth slow pans, would be relaxing. This one makes me dizzy.